The reverse pattern on the jug. This jug is printed with the Man on a Bridge pattern, depicting a single figure standing on a bridge and two further figures standing before a pagoda in a Chinoserie landscape. This shape of milk jug on three feet is very rare at the New Hall factory. 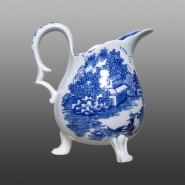 A similar one, but with painted underglaze blue decoration and a different handle, was in the Geoffrey Godden Collection.